Herbert Victor Burlingham set up a coachbuilding firm in Blackpool in 1928. They built bodies for various vehicles but began to specialise in the bodies for coaches for holiday and long-distance travel. In 1930 Mr Burlingham sold his company and moved to Garstang where he founded Burlingham Caravans – still in operation today as caravan sales and servicing company but no longer manufacturing ‘vans. Burlingham coachbuilders become part of Duple Motor Bodies in 1960, which closed in 1989. 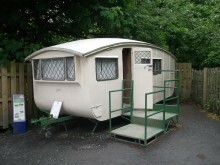 We are unable to date this caravan accurately as no records exist, but it is of a style sold both before and after WW2. Its early history is unknown, but it was sited at Silverdale for many years. During the 1960s it was owned by Mr Cyril Howarth, a steeplejack from Colne who repaired the van as an anniversary present for his wife, it then passed to Mr Peter Murphy of Darwen. 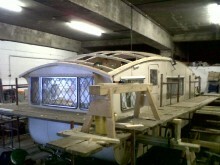 In 1991 the caravan was sold to Mr Norman German who restored it with the assistance of his Youth Training Scheme trainees, after which he used the van and showed it at vehicle and steam rallies, where he met Mr Norman Robinson who had worked for Burlinghams for 51 years and he explained that all the joinery work had to pass the scrutiny of Master craftsman Jimmy Dingle – possibly why the van has survived so long in such good condition. 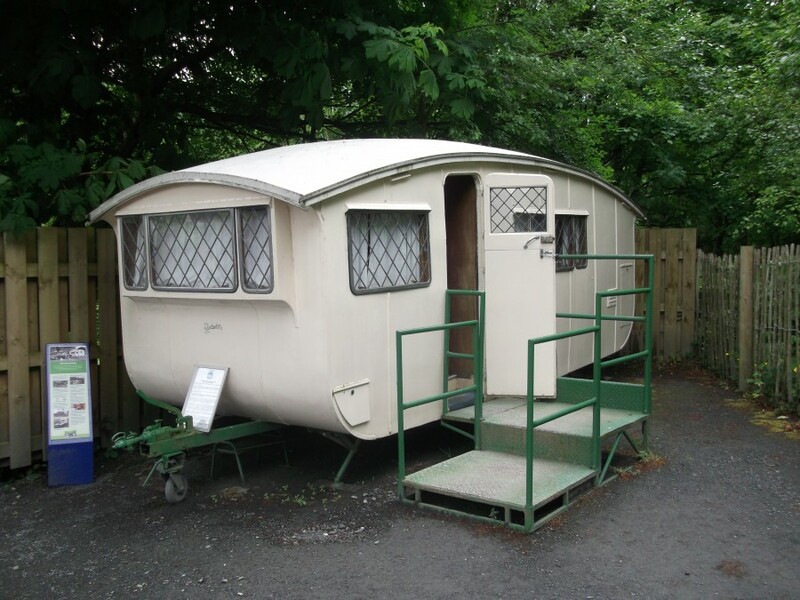 The caravan was loaned to the Museum in 1997 when it was at Holker Hall, the Museum has since purchased it and replaced the entire roof and repaired other aspects – repair work and re-painting is regularly required. 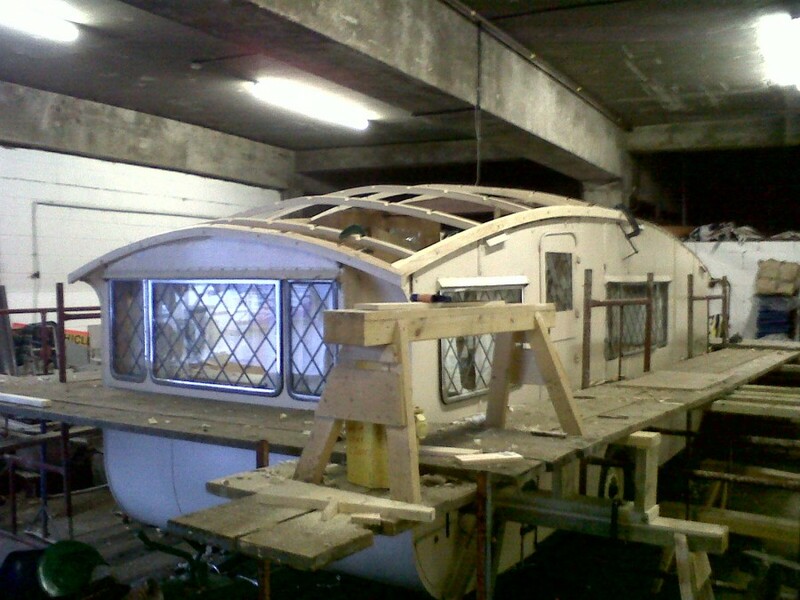 The caravan weighs some 1.5 tons and is difficult to tow – though it looks like a touring caravan we believe it was intended to be located outside for use during the ‘summer’ and placed indoors during the winter season – or possibly sheeted over. The original roof was covered in linen painted with white lead – this suffered if exposed to freezing conditions – so was replaced with modern materials to provide year round weather protection. The ‘van is laid out in 3 sections, the first, upon entering the main door is the seating area which converts to a double bed. The second area is a dining table which converts to a large single bed, and privacy between the bedrooms is provided by the cupboard doors, which open out to meet each other. The third area is the kitchen and toilet .The rear door provides external access to the toilet area – originally assumed to just be a bucket - and once again the door to this area when open provides separation from the kitchen. Mr German’s restoration included some alterations to the kitchen to make it more usable – a fridge and more modern sink was added, but one feature which isn’t obvious is the bathroom – or the lack of one! Under the now carpeted kitchen floor is a rectangular piece of plywood with a small hole in the centre. Under this is a shallow aluminium dish – this is the shower tray! You splashed water on yourself from the kitchen sink – or used a flannel.